Chicken Ala King. Treat For The Family or Gang. This Chicken ala king is such a classic recipe it should be classed with the best of all times. I can remember it from years ago when my mom made it for us. This meal is one that has been a staple and very popular for catering to large numbers of service men and women as well as college cafeterias. It’s not the gourmet meal you may expect in a high class restaurant but remains one of our all time favorites. 1 four to five pound cooked chicken. Skinned, de-boned and cut up into small pieces. In a skillet melt the butter or margarine and sauté the onions, green peppers and garlic and mix in the mushrooms and fry until tender. Set aside. In a large cooking pot stir in the flour slowly to form a paste, add the chicken stock and the milk and bring to a boil. When the sauce thickens add the cooked chicken and sherry and seasoning and now add the onions, green peppers garlic and mushrooms. When thoroughly heated your masterpiece is ready to be served with mashed potatoes, rice or pasta. Easy chicken pot pie is really easy to make. 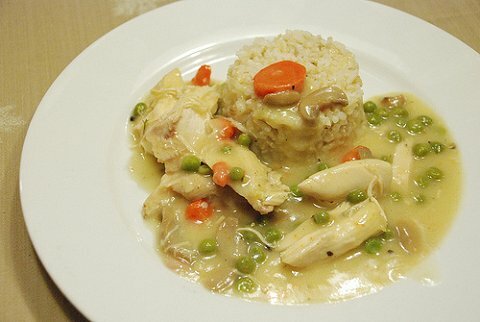 It is similar to a chicken stir fry recipe or a chicken stew recipe as it goes together quite easily. I personally cannot stand the taste of curry chicken recipe as I once served in the navy and we had a cook who nothing about how to make it but we had it almost every day. I grew to detest it. Two of my favorites are chicken fried rice recipe and bourbon chicken recipe.